Today is Easter. I'm so blessed to have a savior who loves me enough to come to Earth to die for my sins. If I were the only one here, he still would have come to die for me. God is so AMAZING! Tristan was SO excited to see what the Easter Bunny brought him. 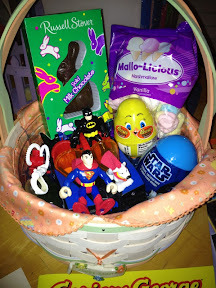 The Easter Bunny must be a DC Comics fan because he got Superman and Batman with a Batmobile. 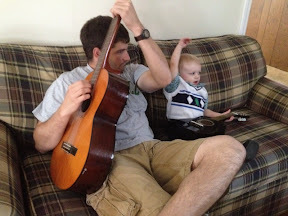 He also got three books (Five Little Ducklings, Curious George and Tadpole Trouble, and Rise and Shine!) and a kite that was as much for his daddy as it was for him. 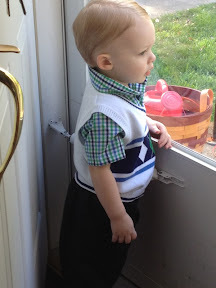 Tristan's Easter outfit was the cutest! 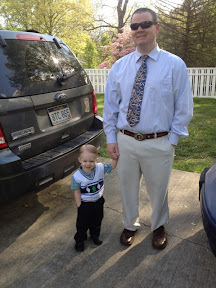 He marched around with his hands in his pockets all day looking like a little man. After church we went to Kim's for dinner. My mom and dad came, too! 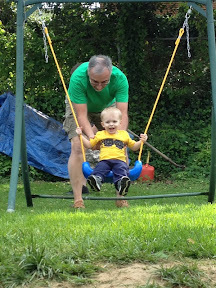 He played guitar with Uncle Curt, hunted eggs, swung in his new swing and ran around in the yard popping bubbles. 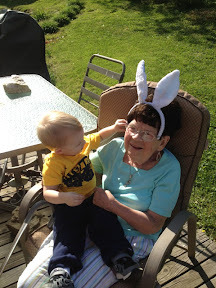 Then we went to visit Memaw and Grampy for a few minutes. 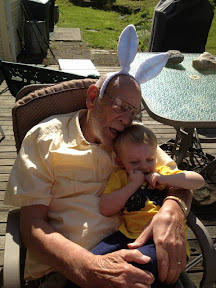 Grampy sang him and song and he put his bunny ears on both of them. Then we went back to church to celebrate Jesus' sacrifice. I'm praying Tristan doesn't wake up because he didn't get a nap and was asleep by 10:30 for the first time in about a year. He tends to not sleep well if he doesn't get a nap.